Officials in Malaysia have confirmed they will review the start time of next year's Grand Prix after last weekend's race was ruined by monsoon rain. F1 boss Bernie Ecclestone switched the start to 5.00pm local time to increase the television audience in Europe. 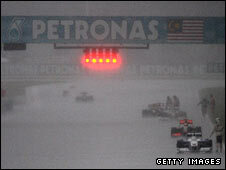 But after a tropical storm made conditions impossible for drivers, the race was abandoned after 33 laps. Malaysia's Prime Minister Najib Razak said: "In the future, we may allocate a different time, perhaps a night race." And Mokhzani Mahathir, chairman of the Sepang International Circuit where the GP was held, said he consulted Ecclestone after the race and they had agreed to look again at the starting time. "I had a talk with Bernie just now and we will review it. "As to exactly what time we will start next year, we are not sure but we will review the timing for next year's race," he added. Ecclestone himself brushed off criticism surrounding the start time, saying he has no regrets about his decision. "No, I just have regrets about the rain," he said. "I don't see anything wrong with the start time, we just didn't know about the rain." Australia and Malaysian organizers refused to organise night races last year, but agreed to push back the timing of the race to 5.00pm (0900 GMT) this season to suit European fans. Mokhzani said they could install a lighting system to illuminate the circuit if the race gets delayed in future years but heavy rain will still be an issue as it makes track conditions dangerous.